I was so glad that the sunshine cooperated today, and I was able to photograph my new headboard for you! 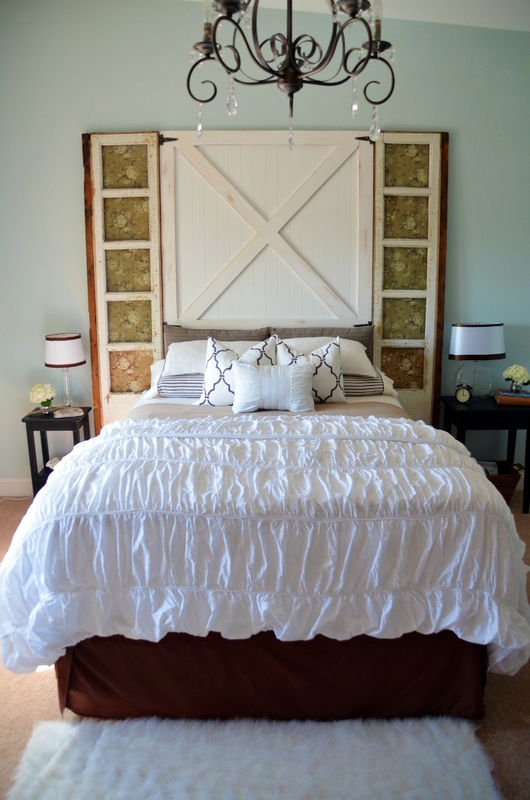 This barn door headboard was a collaborative effort between me and Matt for my birthday. I’ll give you the full tutorial on how it was made in another tutorial. Today is just about the eye candy! 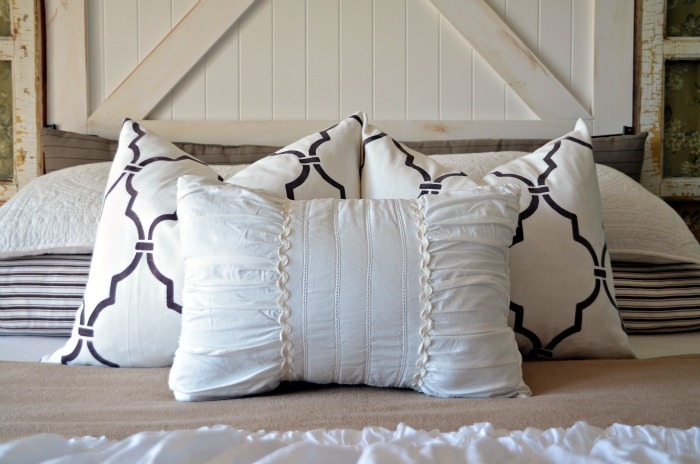 When I hemmed my stenciled curtains, I had enough fabric left over to create some envelope pillow covers for my bed. I love them! 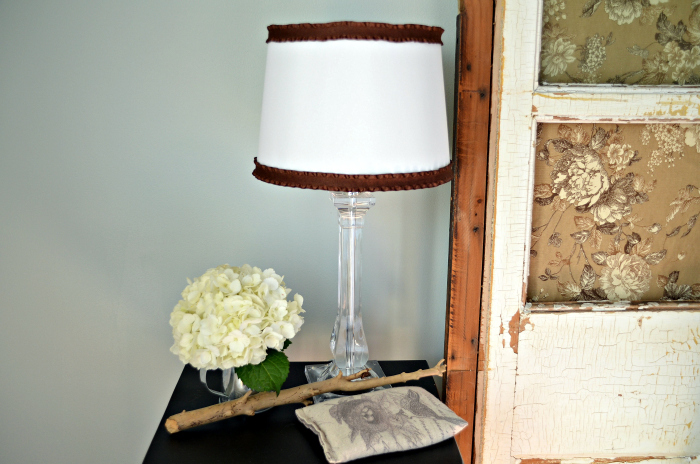 Over the weekend, I glued some brown ribbon around both lamp shades. It’s such a simple way to add some interest to a boring shade. Do you see the cute chalkboard below? I just made that today with some unexpected materials. Tutorial to come later this week! We had this verse in our wedding and I used to have it in vinyl above our bed in our first home. So sweet :). I’m not crazy about the ikea dresser in the window but haven’t decided yet what I want to do with it. I’ll probably paint it but not sure yet what color. And here is my view from the bed. 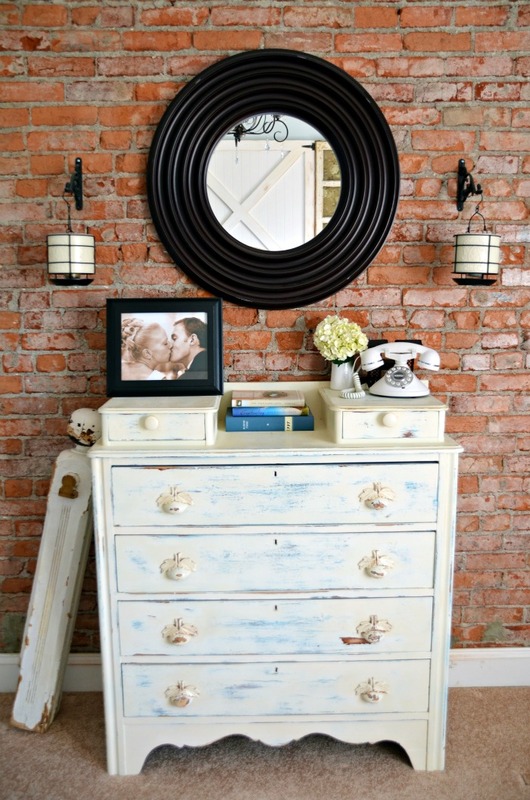 I love my brick wall and my newly distressed dresser. 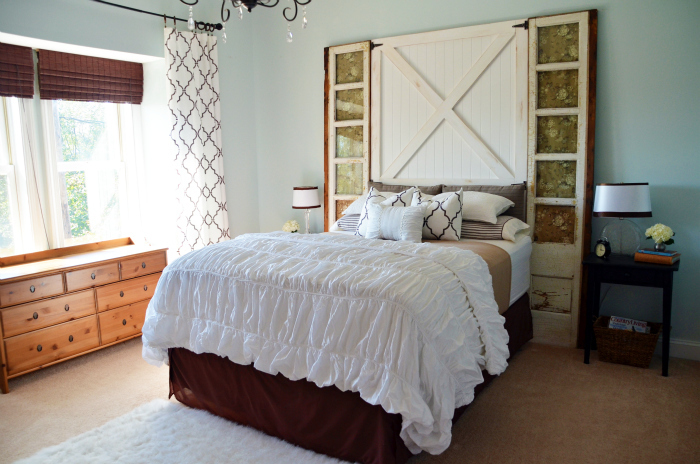 I still wanted to use the fabric that was previously in my windows so placed it on the side doors of my headboard. I wish you could see it in person because my pics just don’t quite capture the entire feel of the room. I am in love with it! will this fit a King size bed? With the doors added to each side it would fit a king, but not without. What an incredibly unique idea for a headboard! I’m also a HUGE fan of brick walls!! The black mirror on the brick wall is stunning! Thanks Erin ;)! They are Benjamin Moore’s “In Your Eyes”. Your curtains are exactly what I’m looking for, so now I’m off to try and find out more about them! I love it!!! 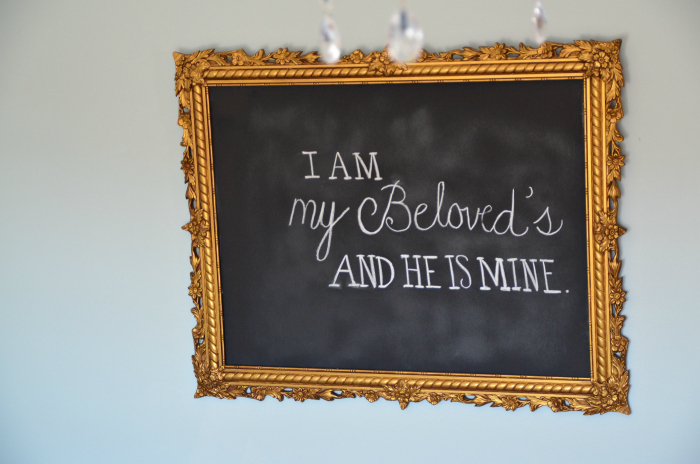 Love everything about it, but especially your verse on the chalkboard! I love that one!!! Suuuper cute. I love it. It was so great to talk to you today. It did my heart good. Thanks for always squeezing me in your busy schedule and never losing touch. You’re the best! Wow! I am so jealous! 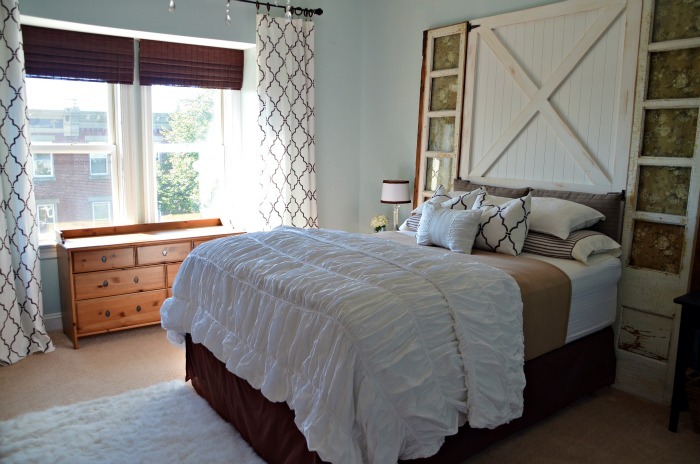 Love the headboard, bedspread, pillows, dresser…um, so when am I moving in? lol Can’t wait to see how you did the headboard. Hey, Beth!! As usual, I’m so behind in trying to keep up across blogland. 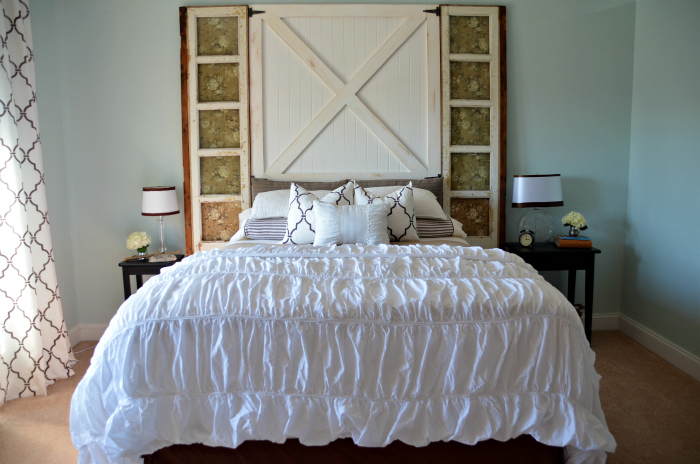 I love your headboard makeover, just gorge girl! Your room is so pretty and cozy, I know you are enjoying it all. Those stenciled curtains are the bomb. I just finished a stenciled wall in my sister’s room and now am IN LOVE with stenciling!! It looks great Beth. And oh, I am so envious of your brick. It looks so pretty. Your whole room looks beautiful. i am looking forward to the tutorial. love this. inspiration for our headboard. thank you! Your bedroom looks absolutely smashing. I love the juxtaposition of the rustic headboard and the glamorous duvet cover. 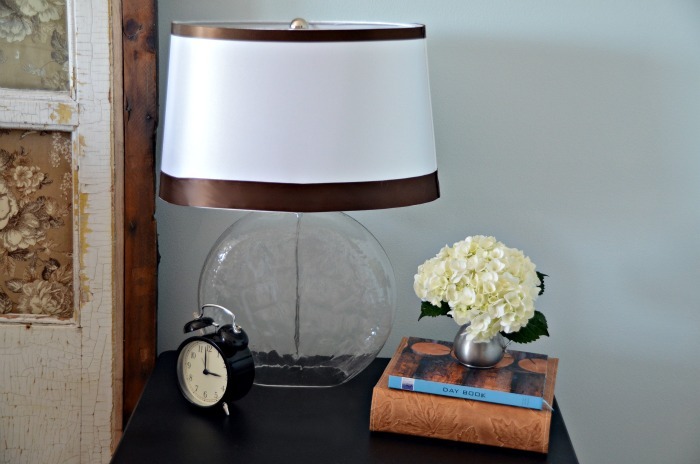 And all the little details like the chocolate-brown ribbon on the lampshades and the single perfect hydrangea really make a difference. Is that the same brown bedskirt? If so, it must feel like it’s died and gone to heaven. If a bedskirt has feelings, that is. Hi Beth!! LOVE your headboard!! By the way, is your bedspread a bedspread or comforter cover?? LOVE it!! Did you make the matching white pillow or purchase with the cover? Also, I think you should paint your IKEA dresser the same green that is in your flower design above your bed to pull the color out even more 🙂 BEAUTIFUL as always! Thanks Kim! The bedspread is actually a duvet from Anthropologie. The little pillow in front came from Target. And hmmmm on the dresser. No green in that flower pattern. It’s all tans, browns, and creams. Monitors can be silly sometimes, huh? the frame around the chalkboard, is that what you got at the sale a while ago? duh. i guess i thought you should be able to read my mind. can’t wait for the tutorial on the barn door. awesomesauce! it looks wonderful. it makes such a statement. is that the frame you got a while ago at a FREE sale? i’m thinking i remember it, because i love all that detail. WOW! Just gorgeous! I feel like I should just pack in all my blogging efforts and go home 🙂 I love everything about the room! Never mind…I just found it on your blog! Love them and will be doing some soon!! Thanks for all the wonderful ideas! I just love them all! Such an inspiration place! Great job Beth! Love all the rustic/handmade touches! Beth!!! Its gorgeous!! I am seriously drooling over that headboard!! I can’t wait to see how you made it!! Every last detail is just beautiful! Love it! So cozy & romantic. What is the name/brand of paint you used on your walls? It is such a soothing color! I vote to paint the dresser red! Wow, your entire room looks amazing! I love every single thing about it! I love it! Can’t wait to see it in person! It’s just gorgeous!! I’m still particularly in love w/ that mirror!! Love it ALL! Now I want to make a new headboard for our bedroom! Wonderful job Beth! I love the frame with the chalkboard. Fabulous!! holy moly Beth!!! Its wonderful!!! LOVE. And the chalkboard, the curtains, the pillows *sigh* all of it! That is an amazing thing of beauty. It’s taking a regular old door headboard idea and taking it even further. Love it. So very pretty Beth. I’m going to pin it. Looks beautiful! Thanks for sharing. I can’t wait until I finally get mine done. I’ve been waiting for this day! (Not so patiently, mind you!) It’s incredible! Your bed demanded the height of that headboard. It’s perfect. Kudos, my girl! Love it! Oh my gosh it’s gorgeous!! What a special space you’ve created. 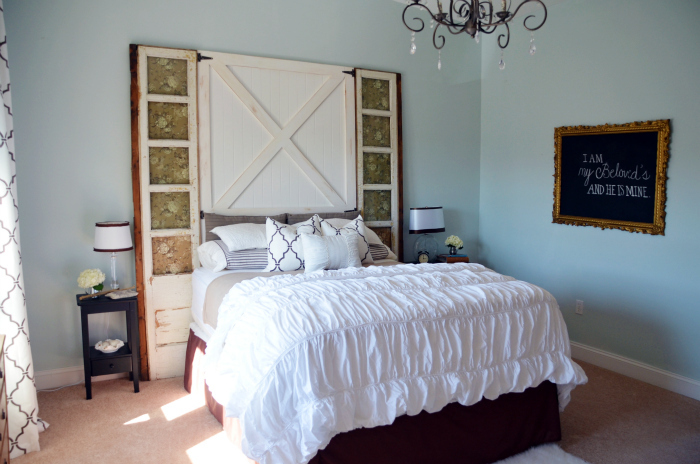 Love, love the headboard!!! I am in love with it too!!! So unique. So different. So beautiful!!!! It’s gorgeous! I love how it turned out! Beth- I LOVE it! Everything looks amazing…it has a rustic, home-y, elegant feel all at the same time 🙂 You’re amazing!! I love it, Beth! The fabric in the door adds such a nice touch. Your pillows turned out very nicely; I’m guessing that these are some you mentioned that you actually sewed? 🙂 Everything ties together so nicely, even the branch on your nightstand. Sweet dreams in your new bed! So beautiful! I love your whole room. 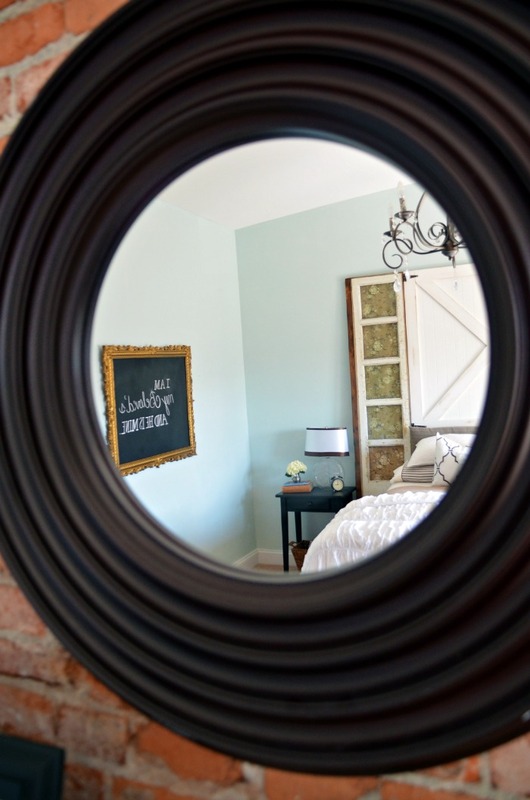 The headboard mirrors the rustic of the brick wall perfectly. Love, love, love. It looks great Beth, maybe you could paint the ikea piece like the other one? I love the drapery fabric too! You’re good girl! Wow. That is simply stunning! I am so envious of you and your beautiful headboard!!! That is fabulous!!! 🙂 Can’t wait to see the full tutorial on the headboard and that great chalkboard! Your bedroom is so beautiful! 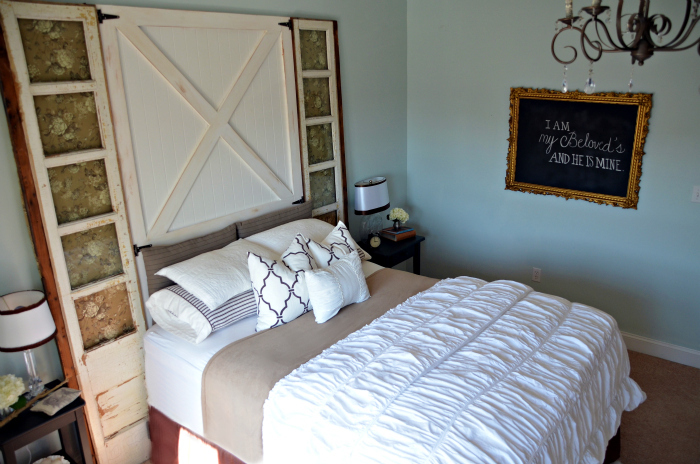 Love the barn door headboard. When you give the tutorial, please share the wall color. Looks great! I love the headboard.